The time has come to return to the realm of Eschalon! A new menace threatens Mistfell and the northern provinces, and evidence of your mysterious past come to light which will make you question everything you know about yourself. Don’t miss this thrilling sequel to 2007’s award-winning Eschalon: Book I! 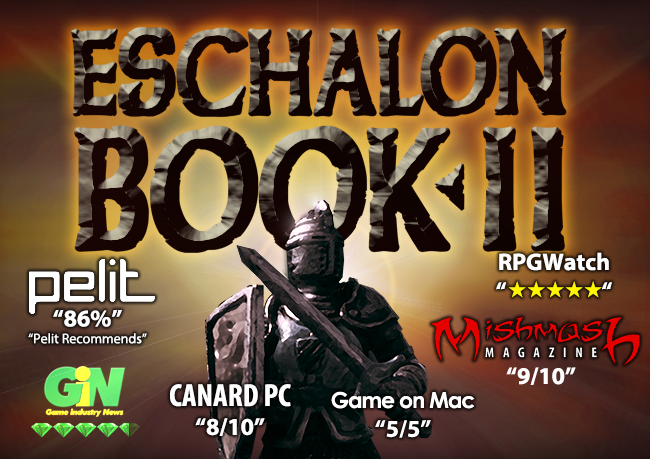 ♦ Eschalon: Book II is the sequel to 2007’s award winning RPG Eschalon: Book I, although no previous experience is needed to play and enjoy Book II. ♦ Book II is available for Windows, Macintosh and Linux-based computers. ♦ Play as a male or female character. ♦ Improved graphic resolution and details. ♦ DRM Free! We respect our customers. ♦ New weather effects: snow, rain, and thunderstorms. Weather isn’t just an effect; severe weather effects gameplay stats and skills. ♦ Additional skills and improved skill balancing. ♦ New difficulty modes and tracked statistics add to replay value.